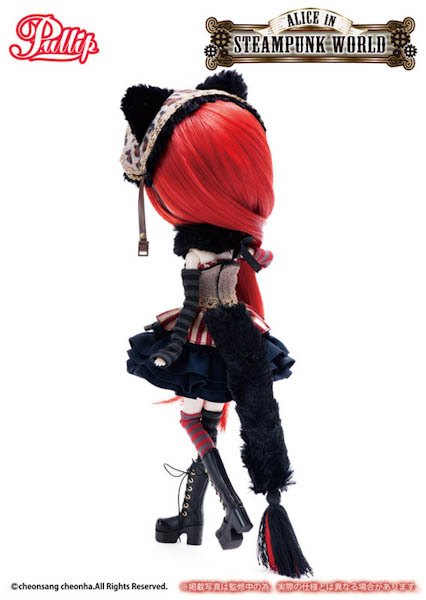 Everyone's favorite grinning cat has been transform into a spunky steampunk doll! 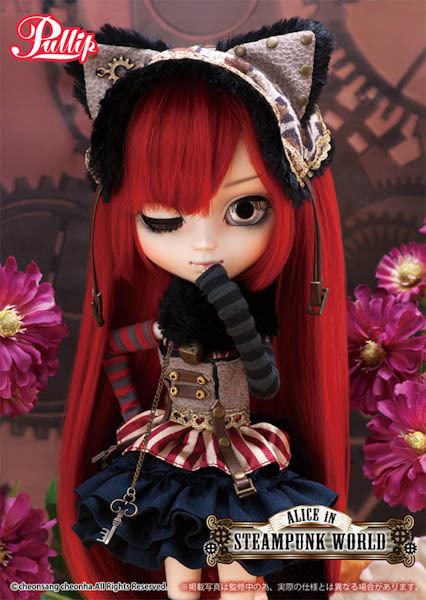 Groove Inc invites you to travel down the rabbit hole again, in October 2016 but this time with the mischievous Pullip Cheshire Cat. 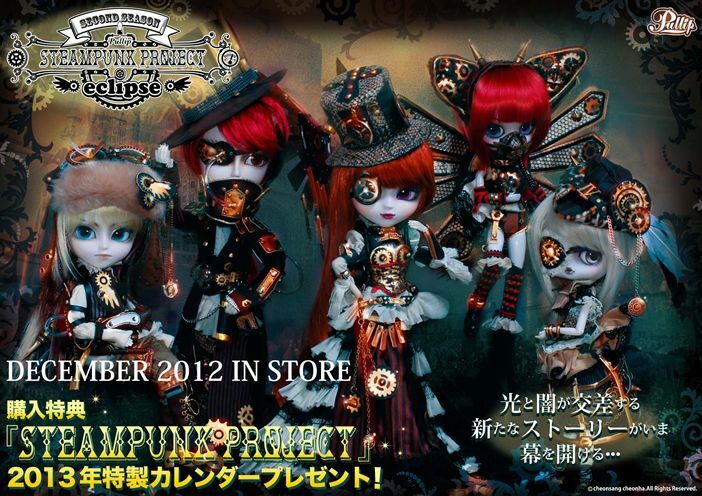 The Alice In Steampunk series 1st debut on May 8, 2015 with the reveal of Pullip Alice and this latest announcement brings the total count of dolls for this line to 6. Cheshire Cat is one edgy kitty. The 1st thing that grabs my attention is her bright fiery red hair. You know, speaking of red hair, I would love to see her next to Taeyang Grell Sutcliff. I think the pair will wreck havoc together with their crazy personality. Her outfit has sort of a circus punk-rock feel with the multi color stripes, corset, bubble mini skirt, and big combat boots. 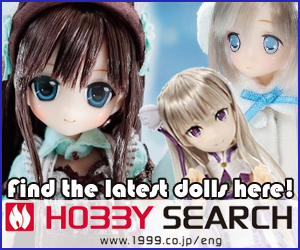 It's like Groove took bits and pieces of Pullip Laura & Pullip Alura and the end result was this fearless girl. When comparing Cheshire Cat to the rest of The Alice In Steampunk crew, you can't help but notice that she's a bit out of place. Her fashion is more flashy and bold while the others are muted and conservative. Her style totally reminds me of Dal Icarus and 3 redheads would've been an unstoppable team! 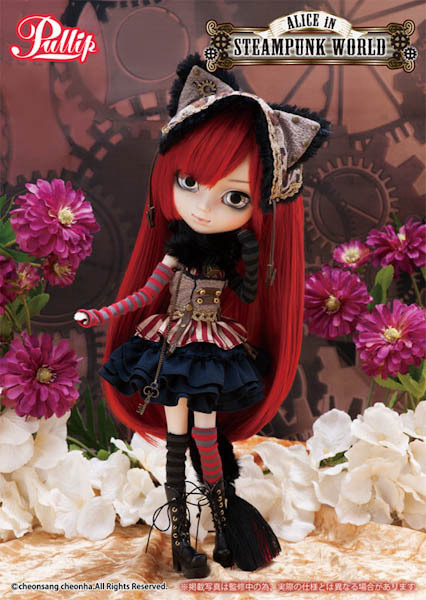 But then again, maybe standing out is part of Pullip Cheshire Cat's charm since Cheshire isn't your typical cat. 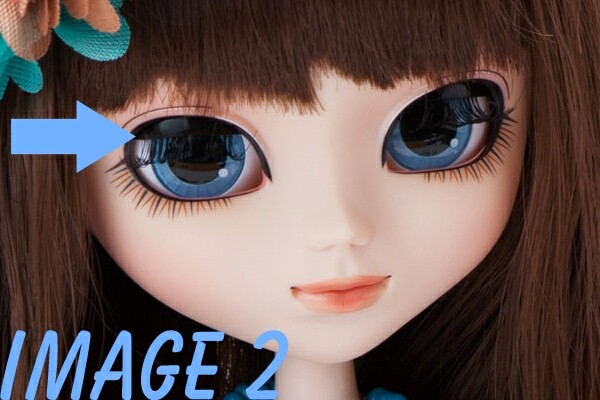 It just so happens that, with the new product on sale today, it has become possible for Pullip's eyelids to be set in 2 positions...!! Together with her usual impressive big and beautiful eyes while fully open, and her graceful mood while closed, a glamorous-feeling state where her eyelids are closed just a little has been added. 1 tiny thing, I wish Groove Inc would've included an iconic grin face mask that could easily be added and removed. I mean Cheshire is famous for his creepy grin. 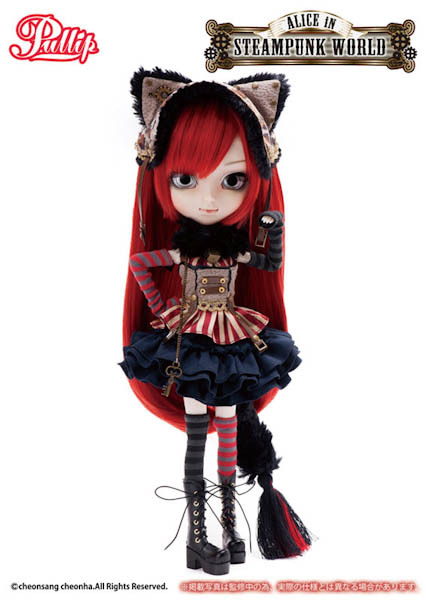 Pullip Cheshire Cat is a versatile doll with a lot of detail and will look beautiful in any collection. 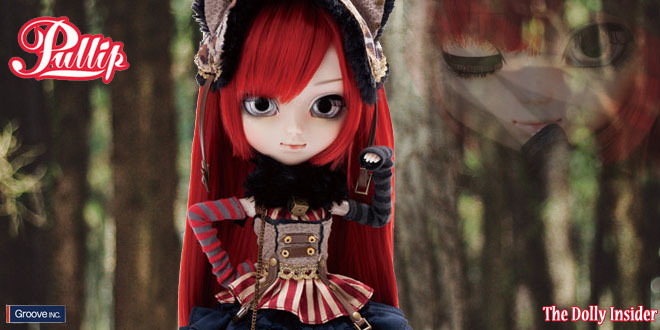 Are you grinning from ear to ear with the announcement of Pullip Cheshire Cat? Or did this release turn your smile upside down? Does Groove get 2 thumbs up for the eyelids? She is fierce! 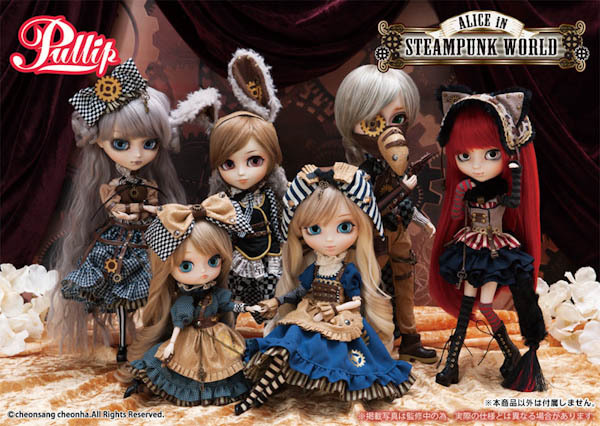 I do not own any of the other steampunk Alice collection Pullips, but I might have to get her. Not really digging the tassel on the end of her tail, that just seems really strange. She reminds me of a gotch, punk version between Akemi and Nana-chan. Also, I can’t wait to see user photos of her eyes up close. They look beautiful! OOOh I forget about Nana-chan, Cheshire would make an excellent counterpart to Nana-chan. The eyes are an exciting new feature, aren’t they? Hopefully owners will get their hands on Cheshire Cat soon. 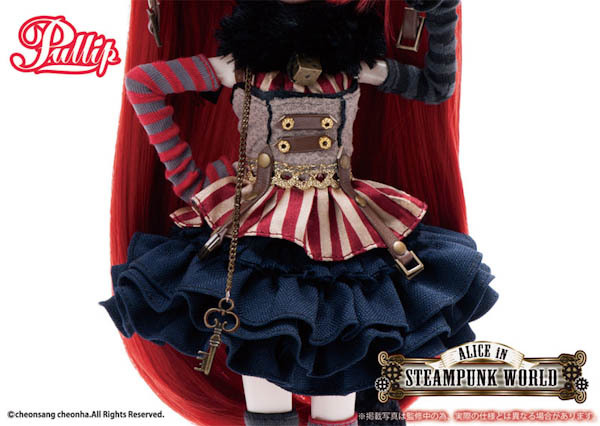 Now that you’ve pointend it out, this release really doesn’t look like she belongs in the steampunk Alice series. 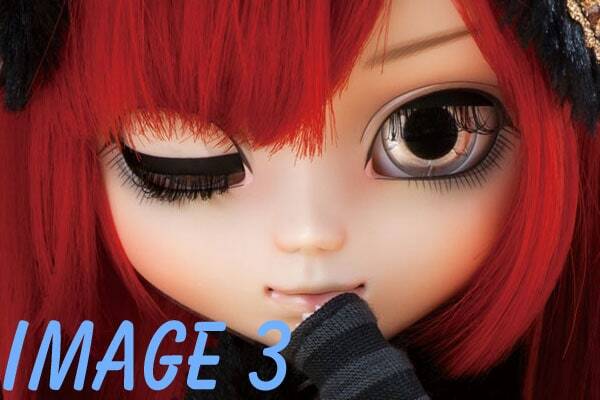 And about the eyelids.. is there something different about them, or does she come with more than one pair? I’m confused a little bit. Though she has a different style compared to the other Steampunk members, it works to her advantage. Dawn you are not the only one confused by this announcement. . . Groove didn’t really provide much information besides the statement above. I had to stare at the images for a looooooong time to catch the difference before I finally realized the new eyelid feature. But other than this Groove hasn’t really told fans how it works. 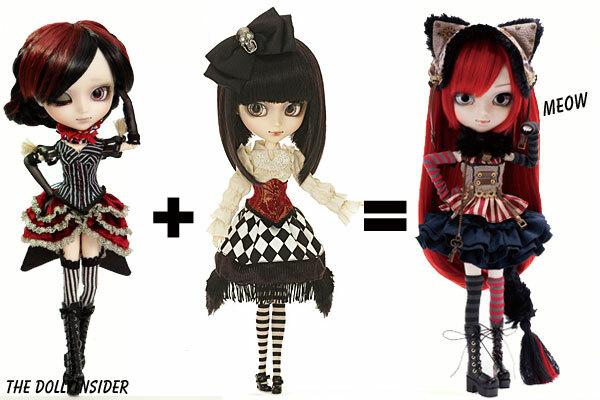 Thanks for talking with me about Pullip Cheshire Cat. Wow! Another exciting Groove announcement this year! I figured they were finished with Steampunk Alice’s World. I love the design, that vibrant red hair and silvery eye chips! Her outfit combines so many different styles that I adore with Pullips. It is kind of funny to see her pictured with the rest of the set since her bold color palette is such a contrast, though I think it makes her more mysterious and otherworldly. I’ve actually been displaying Dal Icarus next to Dal Steampunk Alice on my shelf, I’d love to add Cheshire Cat to the mix, and see the trio together! It’s interesting to hear about the new eyelids too, I’m curious to see what the new half closed position will look like! I do agree that they should have accentuated Cheshire’s grin more since its such a iconic trait. Something like Byul Cheshire du Jardin’s mask could have totally worked while still being an optional add-on. I’m definitely looking forward to this release though! I know, I too thought the The Alice In Steampunk series was complete but it was such a welcoming surprise to see Pullip Cheshire Cat arrival. I’m curious to see how the new eyelids will work too, will there be another lever somewhere? It would be nice if Groove provided us with more info on this new feature. Aww that’s so awesome that you own the 2 Steampunk Dals, I bet Cheshire would look phenomenal in your crew! 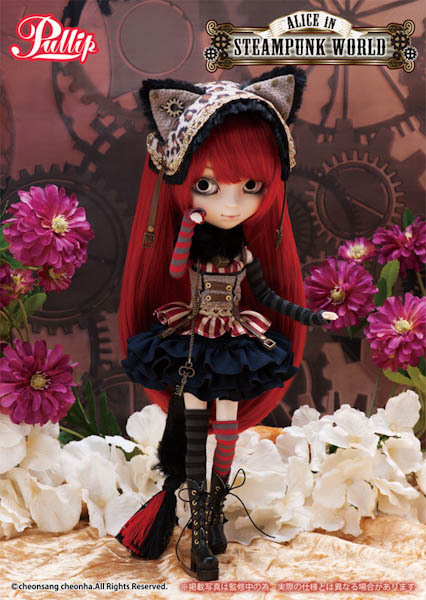 Thanks for leaving a comment on Pullip Cheshire Cat In Steampunk World!